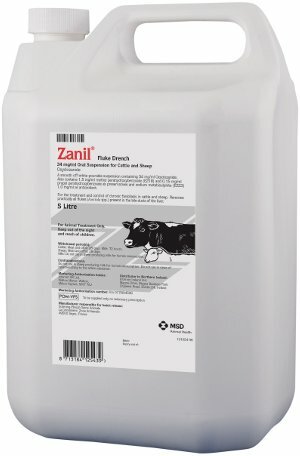 MSD Zanil Fluke Treatment is an oral drench which is highly effective against adult flukes (which cause chronic disease) present in the bile duct of the animal. It can be administered to both cattle and sheep to control adult fluke at any time of year. Based on the active ingredient oxyclozanide, which has no known resistance in the UK, Zanil is highly effective against the adult fluke responsible for chronic disease and – significantly for dairy farmers - is licensed for use in young, pregnant and lactating animals, with a 72-hour milk withhold period where milk is produced for human consumption. Dosage rate is 3ml per 10kg bodyweight in cattle, up to a maximum of 105ml, and 4.5ml per 10kg bodyweight in sheep, up to a maximum of 20ml. Active ingredient: Oxyclozanide 34 mg/ml Excipients: Methyl hydroxybenzoate (E218): 1.5 mg/ml Propyl hydroxybenzoate: 0.15 mg/ml Sodium metabisulphite (E223): 1.0 mg/ml For full list of excipients, see section "Pharmaceutical Particulars". Do not eat, drink or smoke when using this product. Wash splashes from eyes and skin immediately. Take off any contaminated clothing immediately. User should wear chemical resistant gloves during administration of the product. Wash hands and exposed skin before meals and after work. Adverse reactions (frequency and seriousness) At normal oxyclozanide dose levels, cattle may show slight softening of the faeces with the occasional animal showing increased frequency of defecation and transient inappetence. The effects of oxyclozanide overdosage are dullness and some loosening of faeces in sheep and possible diarrhoea, inappetance and loss of weight in cattle. These effects are occasionally enhanced in animals with severe liver damage and/or dehydration at the time of dosing. Use during pregnancy, lactation or lay The product may be given to young, pregnant and lactating animals. Oxyclozanide is an anthelmintic of the salicylanilide group. It is effective against Fasciola species, acting as an uncoupler of oxidative phosphorylation. It may act at more than one site to decrease levels of ATP leading to metabolic malfunction and death of the parasite. Oxyclozanide is slowly absorbed after oral administration with peak plasma levels 24 hours after dosing. Excretion is predominantly faecal, biliary excretion being the most important route of elimination (cattle studies only). Excipients Sodium metabisulphite (antioxidant) E223, Methyl hydroxybenzoate (preservative) E218, Propyl hydroxybenzoate (preservative), Sodium laurilsulphate, Aluminium magnesium silicate, Carmellose sodium, Sodium citrate and Purified water. Major incompatibilities In the absence of compatibility studies, this veterinary medicinal product must not be mixed with other veterinary medicinal products. Shelf life of the veterinary medicinal product as packaged for sale: 3 years. Special precautions for storage Do not store above 25 °C. Protect from light. Do not freeze. Immediate packaging An off-white, smooth uniform suspension in the following packs: - 5 and 10 litre high density polyethylene flexipacks with polypropylene or urea formaldehyde screw caps with wads of PVDC-faced paper or a pulpboard liner. - 1, 2.5, 5 litre high density polyethylene back packs with polypropylene screwcaps. Not all pack sizes may be marketed. Do not contaminate ponds, waterways or ditches with the product or used container. Harmful to aquatic life. Any unused veterinary medicinal product or waste materials derived from such veterinary medicinal products should be disposed of in accordance with local requirements. Below are some recent questions we've received regarding MSD Zanil Fluke Drench Treatment, including answers from our team. Very sorry- you are right that the dosing information is confusing. I would agree that the dosing information on the bottle suggests that for any cattle over 350kg then no more than 105mls is required so in actual fact you have dosed correctly.